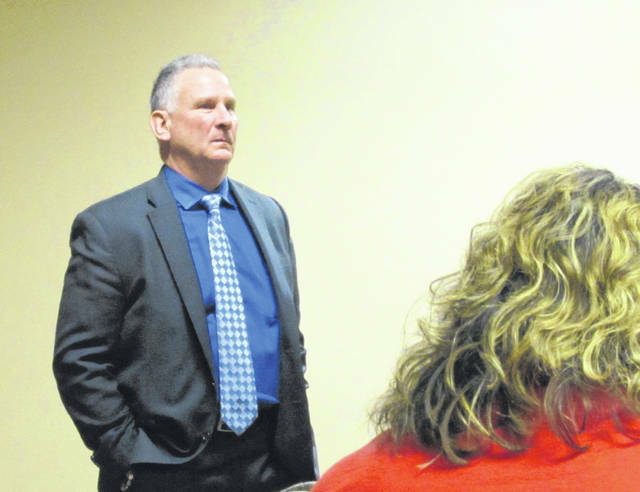 Former Franklin County Municipal Court Judge Scott VanDerKarr is shown speaking to the Highland County Drug Abuse Prevention Coalition on Thursday. A former Franklin County Municipal Court judge and a drug court advocate told the Highland County Drug Abuse Prevention Coalition that specialized court dockets catered to the needs of drug users and other defendants often show strong success. Former Judge Scott VanDerKarr and Heather Mohrman, chief operating officer of Columbus nonprofit Lives Back, gave a presentation and fielded questions from the coalition at the group’s monthly meeting, detailing specialized dockets in Franklin County and the practices that make them successful. VanDerKarr helped establish the first drug court in Franklin County, which has a success rate of about 70 percent. In the Franklin County Drug Court, drug-related fourth- and fifth-degree felony violations are amended to first-degree misdemeanors and the defendants are transferred from Franklin County Common Pleas Court to Franklin County Municipal Court, where they are allowed to enter the drug court docket, VanDerKarr said. They are then required to complete two years of intensive probation with frequent reporting and other requirements. If they complete those two years successfully, their case is dismissed, VanDerKarr said. That court’s success has resulted in other specialized dockets being created, such as a human trafficking court and a mental health court, which work in a similar fashion, VanDerKarr said. According to a PowerPoint presentation from Shanequah Frazier, coordinator of the Franklin County Drug Court, “safety, open discussion and hope for change become building blocks” for success in specialized dockets. Frazier was unable to attend on Thursday, but VanDerKarr and Mohrman spoke for her. According to Frazier, there is distrust among many people, especially African-Americans, of the judicial system. In an effort to build trust, drug courts must facilitate a safe environment in the courtroom, Frazier’s presentation said. Providing hope, staying consistent and being transparent all build trust as well, she said. It’s then that they realize “‘For the first time, they’re not just locking me up and throwing me away,’” said VanDerKarr. Mohrman, a former probation officer, said relapse is an important part of recovery, and when the courtroom becomes a safe place for “clients,” they will often be honest about their relapses and continue seeking help, eventually recovering completely. In a question-and-answer session after the presentation, drug coalition members and guests, including Judge Rocky Coss of Highland County Common Pleas Court, further discussed specialized dockets, funding challenges and unique obstacles faced by Highland County residents, such as poverty and lack of transportation. After the meeting, Coss had lunch with VanDerKarr and Mohrman to further discuss drug courts. According to a Lives Back pamphlet, the organization has created five drug courts in Ohio since 2017, each one with the capacity to serve more than 30 individuals. The pamphlet says drug court participants show a 70 percent success rate in recovery, and the courts save each community thousands of dollars each year. In other information from the pamphlet, Ohio is among the top five states with the highest rates of opioid-related overdose deaths; more than 5,000 overdose deaths were recorded in Ohio in 2017; and 445 Americans die each day from opiate overdoses. The Highland County Drug Abuse Prevention Coalition is a group of mental health and drug treatment service providers, law enforcement officials, people of faith and concerned citizens who meet monthly to exchange ideas on how to prevent drug abuse in Highland County. The group meets at noon every fourth Thursday of the month in the main conference room at the North High Business Center in Hillsboro. The coalition can be found on Facebook at facebook.com/HCDAPC. The next meeting will be held at noon Thursday, Feb. 28.